I am glad it's Friday for two reasons: First, it is another Fabulous Friday reveal at Frosted Designs, and today is our last day of VBS at our church!! Now don't get me wrong, I love VBS. But it is definitely tiring!! I taught 2nd Grade along with my hubby and we had a great group of kids! It has been great to see them enjoying their time each night and also hearing my own kiddies share what they've learned and how much fun they've had. So, with all of that said, let's get to the new challenge this week. We are challenging you to use STAMPS for the Fabulous Friday challenge!! Now I must admit, that I pretty much stink when it comes to stamping. I just can't ever seem to get "that" look that the PRO stampers end up with. My image usually isn't filled in all the way, or it ends up being blurry. Sometimes I just feel like my ink color doesn't really pop all that much. It's just a part of scrapbooking, that I feel like I haven't mastered yet. So this challenge, definitely was a challenge for me. I was really excited to use this line with my photo, because most of the colors in my photo went right along with the colors in Amy's paper line. Bright Neons are really popular right now in Scrapbooking and fashion. I balanced out my brighter colors, by using the neutral grid pattern for the background. Heidi Swapp has some of the neons incorporated in her products right now and I used one of her fun Washi Tapes above and below my journaling strips. Make sure you come play along with us this week and you will have the chance to win a prize from our sponsor, Pink Cricut! You have until Noon on Thursday, July 19, to link up your project for a chance to win!! I have one more quick thing, that I wanted to share with you today. Creating Keepsakes has started holding FREE classes on their Message Board community, Club CK. Kim Watson has hosted 3 classes and they are so informative and fun. She will be holding a fourth class tomorrow, Saturday, July 14. You definitely won't want to miss out on this one, because she will be sharing ideas for creating your own Sun accents. You can participate Live in the class or check back later, if you are not available during the class time. 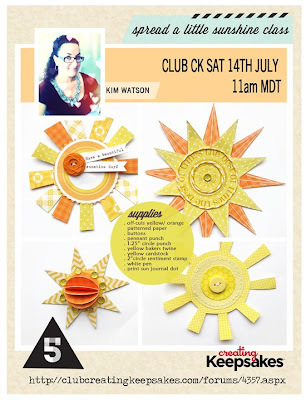 Kim will be chatting and teaching her techniques and ideas for the Sun accents. You can find info HERE, for the class and Kim provides a supply list, so you can get your things ready ahead of time. I hope you will come join in...you definitely won't be disappointed!! This layout is awesome Ashley! You would never know that you aren't comfortable using stamps! You totally rocked the stamping! I am seeing that Amy Tangerine line everywhere these days and I'm sooo loving it! I wish my lss would have got in the 12x12 papers...I just got the 6x6. The road stamp on the chevron paper is awesome and I love that you stamped the road for the cute little bike! Lovely mix of patterns and shapes :) Stamping stumps me too! Absolutely loveeeeeeeeeeeeee your lo!!! You rocked Amy's papers!! LOVING that photo, the flowers, the sun and love love love the clouds!!! GORGEOUS!!!! These papares are amazing aren't they? You've put them together beautifully. I really love the journaling strips with the washi above and below, I will be lifting that! Other than maybe a date stamp, I'm not really much of a stamper either. I've done a few things with stamps, and I have a bunch, but they rarely make it to a layout. I may just have to stretch myself in that direction next, based on your inspiration! This is such a fun layout! You did a great job with the stamping (I have trouble with that too), and I love the triangle cut outs on the green paper! What a GREAT layout--WAY to rock the bright colors! love love love this page! I just love this line from Amy Tan.. I am totally hoarding it. Your alphas are totaly awesome and I love all of your stamps! Sorry I haven't been by here much- miss you lots and hope to be back at it all soon! Love this, Ashley! You did a great job with the stamps...I'm trying to use the more on my pages, too. I love the road sign stamp! You did a fabulous job with these papers...I have them, but just haven't had the chance to break them out yet. I am so in love with the bright colors...I love the green strip with the arrows cut out. And that photo is adorable! this layout is sooo cute, I love all the bright colors and your title is just perfect! I admit I love to stamp but get a little nervous too about doing it on my layouts, like I might mess it up...you did a great job with it, I am sure there will be a lot of entries this week! I just love this bright fun layout. I know what you mean about stamping. I haven't mastered it yet either. I'm always scared because it's "permanent", you can't just take it off the page. I think you did a fabulous job stamping on your layout. I love the close ups of the details. Have a lovely day Ashley! This is one of my very favorites from you ever Ashley! The colors are just popping off the page! You do great clusters, and have an eye for colors and placement. It all looks so wonderful together! This needs to be in a magazine for real girl!! Maybe you could just make me a copy of all your layouts and that could be my new magazine? LOL Only one word for this layout my friend.... PERFECTION! What a fun LO - those colours are so summery! So cute!! Love the bright colors and your journaling on the washi tape! I don't use a lot of stamping on my layouts either, maybe I should give it a try! Thanks for the inspiration! Love your layout with all the bright colors! I don't stamp much on my layouts either, but I've found that if you load your stamp first with Versamark and then your colored ink it really stamps solid areas well. Also using a mousepad under your paper when you stamp helps too! Pretty LO and love the papers and bright colors. Really love the colors in this Amy Tan's collection.